Regnum Carya is rated 5.0 out of 5 based on 1 verified review from YGT customers. Set on the magnificent Turkish coast, Regnum Carya looks out over white sand beaches toward the Mediterranean Sea, a perfect meeting of natural beauty and luxurious comfort. 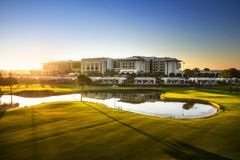 Regnum Carya is at the forefront of resort golf in Belek, the 5-star hotel ranks among the top resorts in the area, whilst the championship Carya Golf Course is widely considered to be the best golf course in Turkey. A testament to the quality of the golf, Carya is the host of the 2018 Turkish Airlines Open, one of the most prestigious events on the European Tour, for the third year in a row. This all-inclusive paradise is located less than 30 minutes from Antalya International Airport, sitting perfectly between the golf club and the beach. The spacious, contemporary rooms at Regnum Carya are first-class, offering all the comforts one would expect of an opulent 5-star resort. There are plenty of ways to relax on-site, including; indoor and outdoor pools, a luxury spa centre, a private beach and many more leisure activities. In the evenings, there are six restaurants and nine bars to explore, plus a host of live shows for your entertainment. Created by the design firm of five-time Open Championship winner Peter Thompson, Carya Golf Club is making waves as the only heathland style course in the Belek area. The outstanding layout offers a true championship experience and while the weather out on course will be distinctly Mediterranean, the accents such as heather framed bunkers and towering pines will give golfers who have played the classic heathland courses in Surrey, a warm feeling of familiarity. The par-72 layout measures a testing 7,186 yards from the back tees and with extensive bunkering and fairways that are well marshalled by towering umbrella pines, it can provide even the most talented players with a stern test. Additionally, five sets of tees per hole make the course manageable no matter the ability of each visitor, and although it was only unveiled in November 2008, Carya has quickly established an enviable reputation as one of the very best courses in the Belek area. Europe's first and only 18 hole lighted golf course. By lighting the 18 holes, Carya Golf Club offers the opportunity of playing golf at night with the comfort of daylight. In this way, guest can enjoy playing golf under the warm climate of Turkey's gold coast. We all saw the recent Turkish Airlines Open held at the stunning Regnum Carya course. Congratulations must go to Thorbjorn Olesen who secured his 4th European Tour victory at Regnum Carya with a brilliant score of 20 under par. The unusual tee box on the 16th which was based on a rooftop villa kept people talking and was one of the course's signature holes. Head to Regnum Carya and you could be following in the footsteps of the European Tour's finest golfers! Congratulations on supplying an excellent value for money golf holiday to the Regnum Golf Resort & Spa. This place was off the scale! The hotel lobby sets the standard, not to mention the 7 bars and 7 Restaurants along with the fabulous buffet. The food was outstanding too, along with excellent customer service. All members of staff were quick to acknowledge you and served with a smile at all times. Spa, 2 outdoor 100m swimming pools (1 heated), waterpark, wave pool, zip wire park, dancing fountains, bowling alley with video arcade games and a fantastic patisserie. Guestrooms were awesome as well and had every toiletry you could imagine, along with a well stocked mini bar which was FREE. We played at Carya twice, once under floodlights...what an experience that was! The course was a good challenge with the fairways and greens in excellent nick. There are some good water holes that make you think and they look fantastic, especially under floodlight. My favourite is the Par 4 10th with water all way down the left. This course is suitable for all abilities and is one not to be missed, with great practice facilities with a nice club house too. Staying at the Regnum meant we were all inclusive in the clubhouse which was excellent value and the food and service was very good. The free shuttles were on hand so you did not have to wait very long for transferring back to your hotel. This applied to all the courses we played. We played the National which has 27 holes, I prefer 1-18, the layout is exceptional and very interesting, and again fairways and greens were in good condition. The Clubhouse overlooks the 18th green and is a great place to sit out and chill. The food and drink was inclusive if staying at the Regnum...again fab value! We went on to play the Sultan which is a good test of golf and has some water to contend with. My favourite hole is the par 5 16th which has water down the right, and with water protecting the green too, you certainly have to think your way to the hole. Finally we played the Pasha which I think is the easiest of the courses we played. It was still a test and in good condition. To sum up, all the courses were excellent and suitable for all abilities. My favourite along with the clubhouse is the National and overall, Turkey as a golf destination is well worth a visit and excellent value. The Regnum is one of the best hotels I have stayed in, it’s not pretentious and you are treated like royalty with a smile. Why go anywhere else? Booking this holiday with Your Golf Travel was an easy process, with help from our friendly and efficient agent Ashley. He came up with a great deal along with the tee times we wanted, ensured the transfers were slick and on time, guaranteeing a smooth start and end to our holiday. This holiday was a 10 out of 10 for all my group, we had a fab time and we all want to return again. We would recommend booking your holiday with Your Golf Travel.